Didier Le Calvez is in it for the long haul. 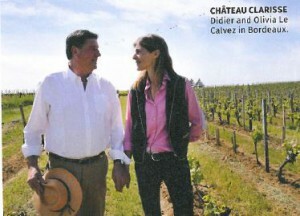 Seven years ago, the managing director of Paris’ Le Bristol hotel and his wife Olivia, purchased a 15.5 hectare vineyard in Puisseguin-Saint-Emilion with family front of mind. Named after their daughter and with packaging designed to reflect her « Irish » colouring, a strong motivation for the coupleto buy Château Clarisse was so their children could grow up with an appreciation of the land. It is this same long-term vision that has led Le Calvez to introduce organic practices to the vineyards with an eye towards biodynamics. The first vintage was 2011, and there are two wines in the range; the entry-level Château Clarisse (A$60) is balanced, firm and blue-fruited, and the Vieilles Vignes (A$110) is a more powerful and intensive wine made from 80-year-old vines, the oldest on the property. Le Calvez has no interest in raising prices, but rather in refining the winemaking in an effort to establish a brand recognised for its quality and consistency, and nursing a productive vineyard that he can pass onto his children. It’s an admirable philosophy.